It’s fair to say that when I was asked to become Chairman of the team I support I was chuffed to bits. Images of cigar-smoking, brandy-swilling, blonde-holding flashed through my mind but alas being Chairman means I’m still programme co-editor, match day announcer, website editor and communications co-ordinator. But it’s still a bloody great honour and I agreed to do it because I deeply care and believe in what we stand for and do as a club. We’ve got a vision and we are going to deliver on it, and to be leading that is bloody exciting. So 10 days into the role and we find ourselves without a management team, looking down at the relegation zone and facing our biggest cup game in 10 years. So Stuart, what are you going to do now? The words of Lance-Corporal Jack Jones came into my head. Don’t panic. Fortunately, having the likes of Bazza Collins and Club Sec Kev around meant we quickly had a plan. Even Kev’s wife Laura giving birthday to baby Henry didn’t knock him off his stride. Within 7 minutes of the announcement of Garry Wilson, Danny Bloor and Dean Lightwood leaving the club I received my first phone call. A journalist (no names) asked if “mutual consent” was agreed by both parties. 4 minutes later I received the first job application by email. And so the madness began. 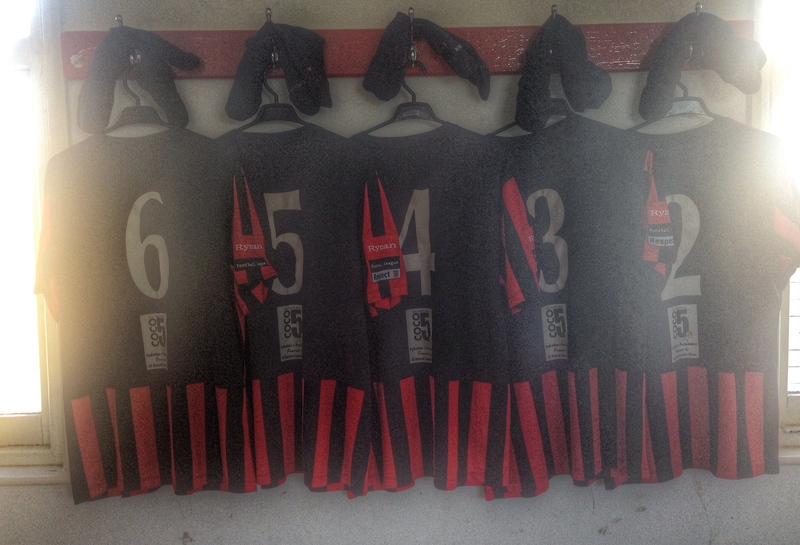 Despite Lewes “just” being a step 7 Non-League club we received over 20 applications. Some well-known people, and not just in terms of the Sussex footballing scene, applied including four candidates who had Premier League experience. Never judge a book by its cover is as true in this situation as anywhere else. Good footballers rarely make good managers. We also had applications from people with absolutely no background in Non-League football or management in general, who put over compelling arguments why they should be considered. Perhaps in different circumstances where we weren’t fighting for our Ryman Premier League survival we may have talked further to these people but we needed a wise head who could guide us out of the tricky situation. Our caretaker team of Martin Hinshelwood and Steve Eke did us proud in the interim period, taking four points from a possible six and more importantly, guided us to our first cup final in ten years. In a very short space of time I’ve come to realise that being chairman isn’t just about swanning into the ground at 2.55pm having parked the Jag in my reserved space and shaking hands with a few fans. Firstly, I’m in the ground around 2pm on a match day taking care of all those duties that I did before being chairman that, like at most Non-League clubs, most fans think the pixies do. There’s no Jag either, nor is there a reserved parking spot unless you call the one marked “Reserved for Hair & Beauty clients” in Sussex Downs College car park, which for some strange reason nobody ever parks in but me. Being a Chairman means that people expect you to do things that other people won’t do. In just a month I’ve lost count of the number of times I’ve heard from my colleagues the phrase “As Chairman, you should do that Stu”. Not that I’m complaining – after all if the shoe was on the other foot, I’d do the same. Being manager less for a few weeks also means I have to field the calls from journalists. Some will write what you say, others will try and second guess the meaning of what you have said and print that instead. Just one “added” word can cause offence, embarrassment or anger to anyone and everyone. Fortunately, in my real word job I’ve had a bit of training in dealing with journalists so am pretty good at keeping things “on record”. During the period where the managerial search went on there was very little speculation in the press bar a few names that the journalist in question had observed watching our games. We’ve all heard the stories about secret trysts in service stations to do deals (legitimate ones not featuring shoeboxes full of cash I hasten to add!) away from prying eyes but I never thought that’s what really happened. That was until I’d agreed to meet one prospective candidate for the manager’s role and he asked if we could meet in a pub, some miles away from Lewes in a very rural location. Even as I pulled into the car park I doubled checked the mirror to make sure I hadn’t been followed. The Current Mrs Fuller even questioned me as to whether I was meeting another woman (or women as she said – I like her style at suggesting I still had the energy). But the story has a happy ending. We got our man and today we welcome ex-Charlton Athletic legend Steve Brown into the dug out for the game versus Kingstonian. Could he start with a win? Our record in previous seasons against the K’s isn’t good, having taken just 2 points in the seven games we’ve played against them in the last four seasons. There has also been a red card in every game we’ve played against them in recent times. Expect a dull 0-0 draw then! Nil-nil it nearly was but it certainly wasn’t dull. 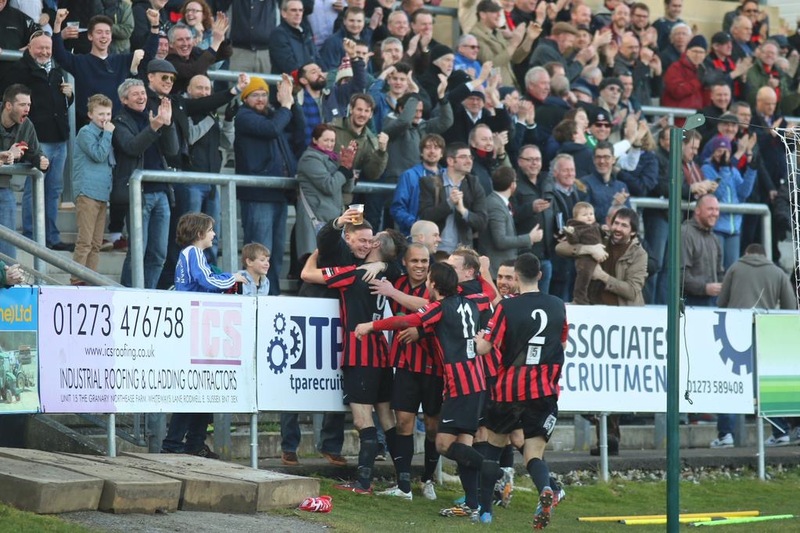 Lewes can mark this one down to the Footballing Gods, smiling down at them as Kingstonian were well and truly robbed. The Rooks finished the game with nine men whilst Kingstonian could only rue a hat-full of missed second half chances including a missed Gomez penalty. To be fair to both sides, the extraordinary sight of the sunshine probably distracted them from trying to play football in the first half, with neither side really creating any chances in the first period. The half was livened up in a three minute spell just before the break that saw two red cards. First up was Kingstonian’s Alex Addai who simply lost the plot, planting his head into the face of Tom Davis for a tackle made by Matt Crabb. Addai then displayed all of the characteristics of a 5 year old being told he couldn’t go to Thorpe Park. Jumping up and down, trying (and failing at first) to remove his shirt and then sitting on the naughty step. He was joined there a few minutes later when Sam Cole appeared to leave his foot in when challenging for the ball and he saw a straight red. 10-a-side it was to be after the break. Lewes started the half well, with the K’s now infamous keeper Rob Tolfrey being called into action to keep out a James Fraser shot from 40 yards and then a point-blank range Elphick header. Seconds later Lewes keeper Rikki Banks charged out from his line and took out Pico Gomez. Clear penalty. Gomez stepped up and smashed the kick against the post. Perhaps this was to be our day. With five minutes to go Lewes launched a free-kick into the box. Tolfrey came for it, dropped it and Rowe slotted home. Cue manic scenes as the players joined in with fans celebrating including one chap who had obviously given his wife a break and brought their baby to the game. He was almost offering his child to the players to celebrate with. In my experience that may get you a telling off a home, especially if you also douse the child in beer. There was still time for the referee to make a complete fool of himself by only booking the K’s centre-half for scything down Sam Crabb, a tackle far worse than Sam Cole’s first half red. Brotherly concern and love took over as Matt Crabb pointed this out to the ref and was given a red card. So three points, a winning start for our new management team and a pretty decent roast pork loin ciabatta with apple lavender slaw and smoked chilli for a pre-match snack. We will have better days, we will have worse days. But for today, the lot of the chairman is a happy one. This entry was posted in Lewes FC, Non league football, Rymans Premier and tagged Chairman, Kingstonian, Lewes, Non League, Ryman Premier League, Steve Brown. Bookmark the permalink.